« Taxes: Who pays how much? How & to whom do they pay it? 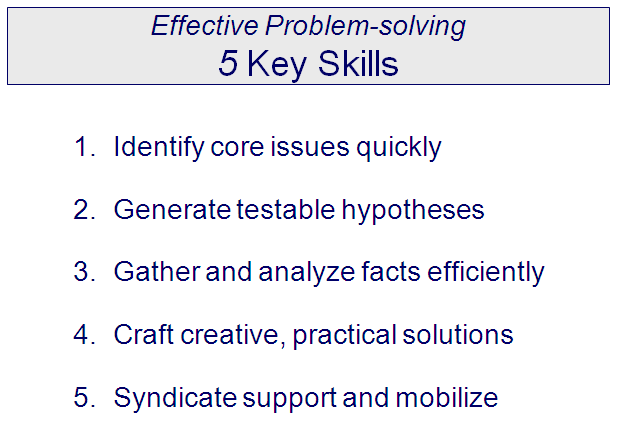 In a prior post Effective problem-solving … the five key skills, we isolated 5 key problem solving skills. How can that be? What explains the misses? Based on my experiences, there are 4 at least 4 frequently encountered stumbling blocks that managers often encounter. Wandering in a foreign land: Often, managers just don’t have the perspective – drawn from experience or education or whatever – to fully understand the nuances of a problem or recognize the tell-tale patterns. Trees obscure the forest: The initial observation related to complex problems, which – by definition — come laden with extraneous or equivocal information that sometimes clouds the picture and causes cognitive solution. Unconscious biases take over: For example. how about cutting the Federal deficit? If you present the problem to a fiscal conservative, they’ll immediately start probing for spending cuts. If you ask a liberal, they’ll start figuring how to raise taxes. Same problem. Different perspectives drive by in-going biases. (Preference for simpler problems: In his book “Thinking Fast, Thinking Slow”, Adam Tversky argues that most mortals – when confronted by a hard, complicated problem exhibit a burning urge to to solve a simpler problem … one they’ve seen before, or one that seems simpler and more solvable. So, how to jump over these stumbling blocks? Start generic, then get specific: If you’re unfamiliar with a particular industry or situation, take it up a level of abstraction. That is, conceptualize it with relevant elements that are more familiar. Then, adjust to the specifics of the situation. Clear clutter, structure problem: Get down to the absolute essentials. Purge the problem of the distracters that aren’t germane or the factors that aren’t likely to influence the answer. Don’t be lured to information that may be interesting but not determining. Once the canvas is cleaner, patterns should be easier to discern. Stay focused and be objective: This hard because many biases are sub-conscious. Ask yourself if a person with a different slant would come to the same conclusion. This entry was posted on December 18, 2012 at 6:50 am and is filed under Decision-making, HITS, Problem solving. You can follow any responses to this entry through the RSS 2.0 feed. You can leave a response, or trackback from your own site.